These individual desserts bake up with a gooey sauce beneath a layer of rich, tender cake. We tried a few different types of whiskey here: our favorites were Jameson for its clean, bright flavor and Rittenhouse rye for its spicy depth. This recipe can easily be doubled to serve eight. 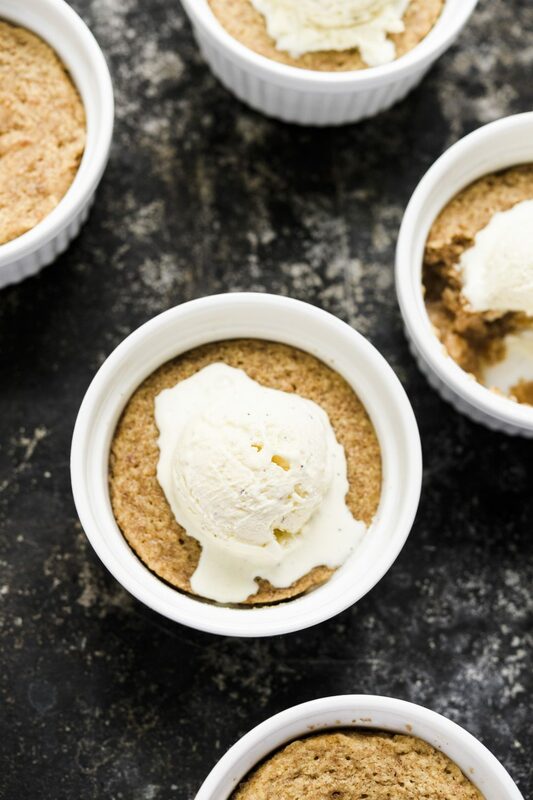 Serve the pudding cakes warm, with vanilla ice cream or lightly sweetened whipped cream. In a small saucepan over medium, combine ½ cup water, the maple syrup, vinegar, 4 tablespoons of whiskey, 2 tablespoons of butter and ¼ teaspoon salt. Bring to a boil stirring occasionally. Reduce to low and simmer 5 minutes. Remove from heat and set aside. In another small saucepan over medium, melt the remaining 6 tablespoons butter. Cook, swirling the pan, until the mild solids at the bottom are deep golden brown and the butter has the aroma of toasted nuts, about 5 minutes. Transfer to a medium bowl and cool to room temperature. Meanwhile, heat the oven to 325°F with a rack in the middle position. Mist four 6-ounce ramekins with cooking spray and place on a rimmed baking sheet. When the butter is cool, whisk in sugar, milk, egg, vanilla, and remaining 2 tablespoons of whiskey. Set aside. In a food processor, process the pecans until finely ground and beginning to clump, 30 to 40 seconds. Add the flour, baking powder, ½ teaspoon of salt and pulse until combined about 4 to 5 pulses. Add butter mixture and pulse until smooth, thick batter forms, about 5 pulses, scraping down the bowl once. Divide the batter between the prepared ramekins. Gently pour the maple mixture over the batter in each ramekin. Do not stir. Bake until the cakes are puffed and the centers jiggle only slightly, 25 to 30 minutes. Let cool on the baking sheet for 10 minutes before serving; the cakes will fall slightly as they cool. Don’t stir the maple-whiskey syrup into the batter after dividing it among the batter-filled ramekins. With baking, the syrup will form a sauce at the bottom. 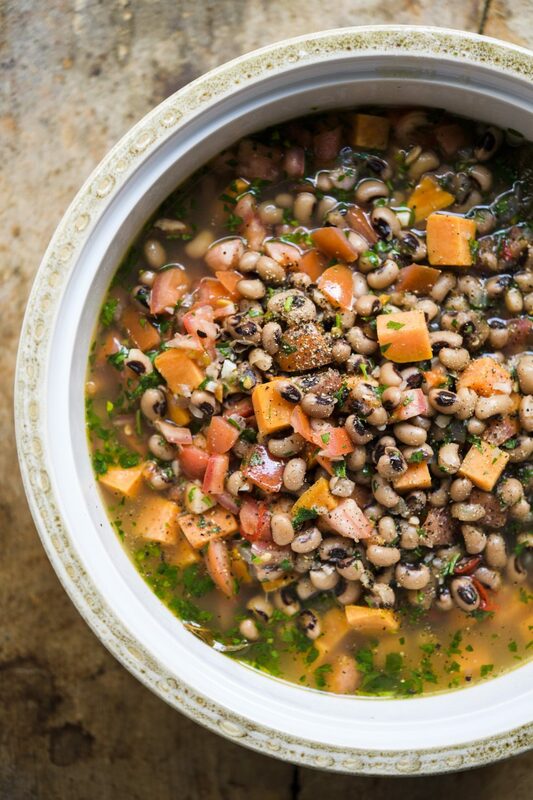 Black-eyed peas are a West African staple. In this recipe for Senegalese ndambe (pronounced NAM-bay), they're simmered with sweet potatoes to make a hearty vegetarian stew. Canned black beans keep this dish fast and simple. In a large Dutch oven over medium, heat the coconut oil until shimmering. Add the onion, 2 teaspoons salt and ½ teaspoon pepper, then cook, stirring, until light golden brown and softened, 7 to 10 minutes. Stir in the garlic and chilies, then cook until fragrant, about 30 seconds. Add the black-eyed peas, bay leaves and 5 cups water. Bring to a simmer over medium-high, then reduce to medium and cook, uncovered, stirring occasionally, until the flavors meld, about 15 minutes. Stir in the sweet potatoes and 2 teaspoons salt. Cover, reduce to medium-low and cook until the potatoes are tender, 10 to 15 minutes. Off heat, stir in the tomatoes, parsley and lemon juice. Taste and season with salt and pepper. Serve with lemon wedges. Tip: Don't use neutral-flavored oil in place of the coconut oil. 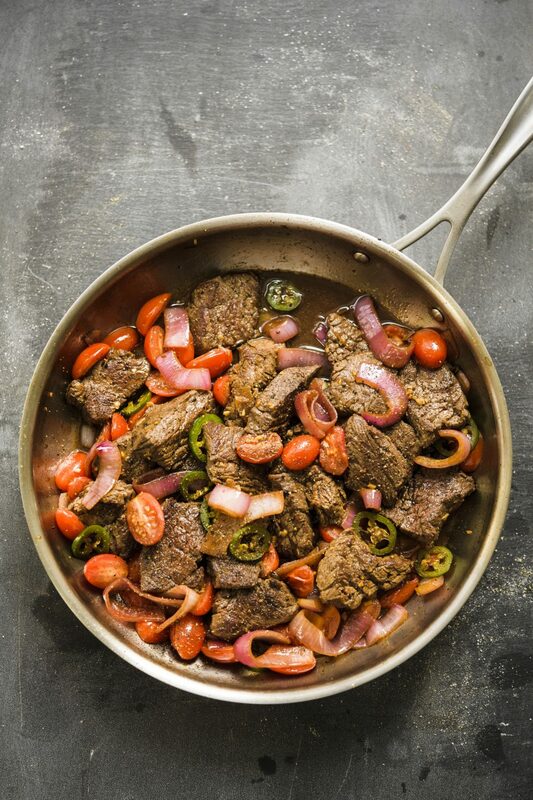 Coconut oil—particularly unrefined—infuses the stew with a sweet aroma while adding richness. This is our adaptation of traditional Oaxacan hot chocolate, which uses freshly roasted cacao beans to provide chocolate flavor and finely ground nuts rather than dairy to add richness. Since cacao beans are hard to find in the U.S., we opted for unsweetened chocolate; like cacao, it has no added sugar or milk solids, so its flavor is pure and potent. Even average supermarket brands yielded excellent results. A small amount of almond butter was an easy way to give the drink a rich creaminess. 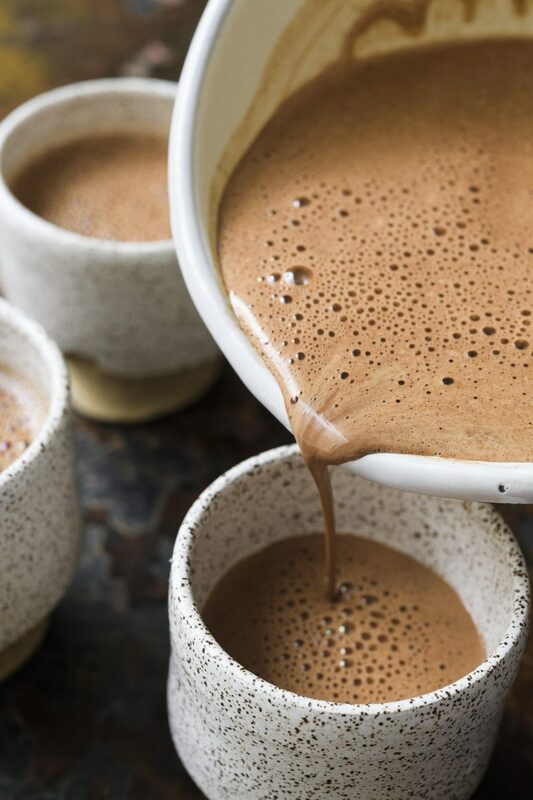 Contrary to popular belief, traditional Oaxacan hot chocolate is not flavored with chilies, but we did like the gentle tingling heat of a dash of chipotle chili powder; add up to ¼ teaspoon, or leave it out, if you prefer. Leftovers can be refrigerated in an airtight container for up to three days. Reheat gently in a saucepan over medium-low just until steaming. In a blender, combine the chocolate and 2 cups hot water. Let stand until the chocolate is softened, 1 to 2 minutes. Add the sugar, cinnamon, salt, almond butter and chili powder (if using). Cover the blender and, holding the lid in place, blend on high until smooth, 30 to 60 seconds. Pour in the 1 cup boiling water and stir with a spoon to combine (do not blend). Pour into cups or mugs and serve. Tip: Don't use boiling water to soften the chocolate in the blender, as it will cause pressure to build in the jar when the blender is turned on; the water needs to be only about 100°F. (However, boiling water stirred in at the end ensures that the drink is hot for serving.) Don't use raw almond butter. The toasty flavor of almond butter made with roasted nuts is key to a rich, full-flavored drink. Za'atar is a Middle Eastern blend of herbs and sesame seeds; look for it in well-stocked markets, Middle Eastern grocery stores or online. We mix za'atar with dried oregano to boost its herbal flavor. 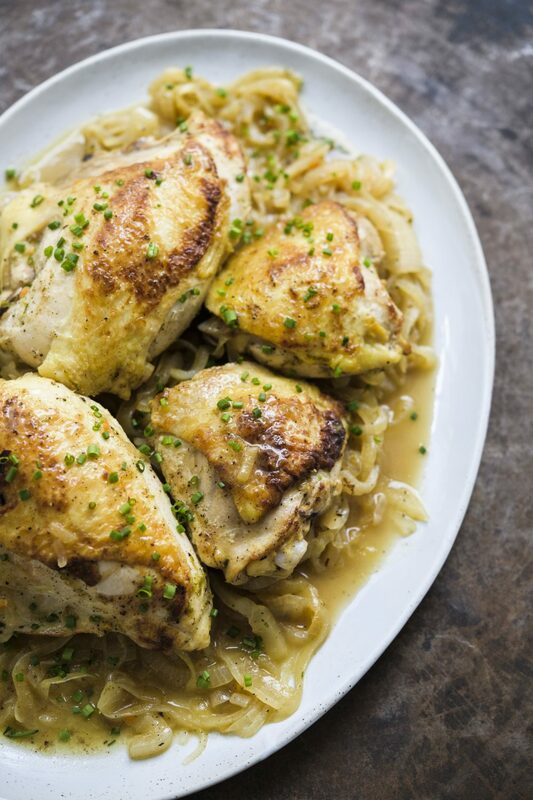 Use chicken breasts, legs, thighs or a combination. With just a few ingredients, yassa ginaar delivers multiple layers of flavor—savory yet sweet with lightly caramelized onions, citrusy with lime zest and juice, meaty from the deeply browned chicken, and spicy from the heat of a habañero chili. 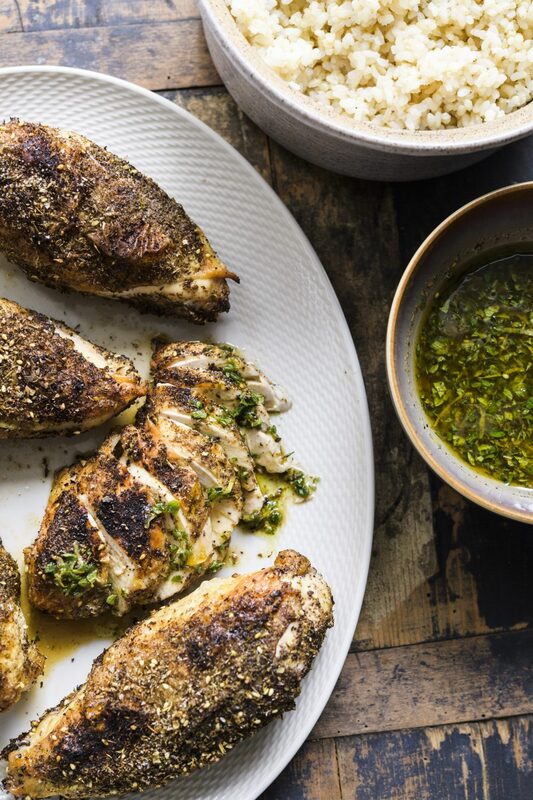 Our version is based on a recipe in “Yolele!” by Pierre Thiam, who marinates then sears the chicken, then uses the marinade as a base for the flavorful sauce. Bouillon concentrate adds to the savoriness of the dish; our preferred brand is Better than Bouillon. Serve with steamed rice. 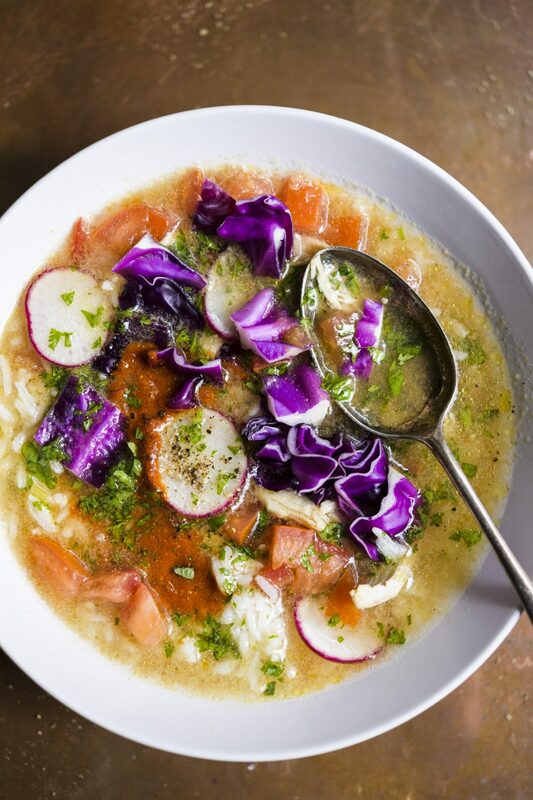 This brothy soup is particularly good for serving family style. Bring the pot to the table along with the radishes, cabbage and lime wedges, then have diners fill and garnish their bowls they like. Offer a simple homemade or store-bought hot sauce alongside. Hot steamed rice, added to bowls before the soup is ladled in, is a satisfying addition. 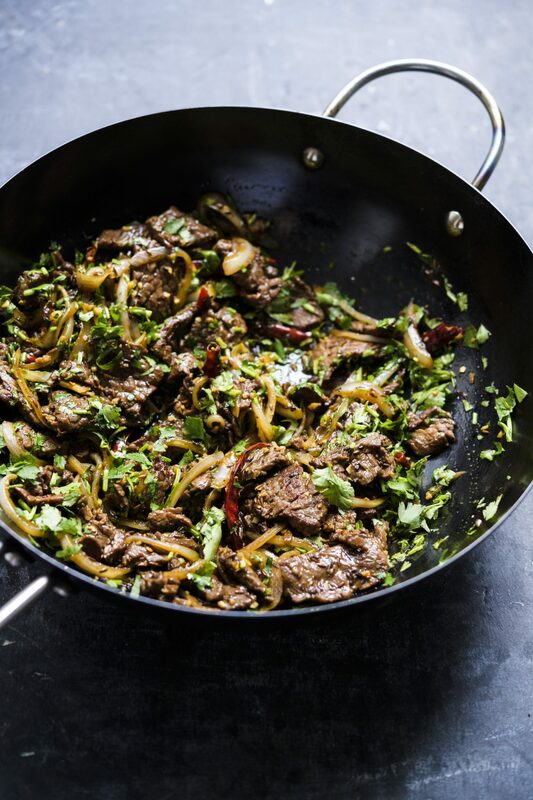 For this bold, paste-like sauce, macerating the onion in lime juice tempers its harsh bite. For a brighter flavor, substitute sweet paprika instead of smoked. This sauce is best used the day it is made. This sauce is spicy and sharp on its own, but a spoonful stirred into a serving of soup provides the perfect flavor accent. Store leftovers in an airtight container in the refrigerator for up to a week.